Let’s take a break from all the desserts today, shall we? This post is all about meat, meat and meat! Forget about dealing with oil and frying pans – just imagine baking these lovely concoctions in the oven. You will only have to deal with one (or several baking sheets, if you have a small oven like me), and if you lined the baking sheets with parchment paper, you probably wouldn’t even need to scrub any pans or baking sheets during the clean up! We all know how terrible it is to scrub stuck bits of food off pots and pans, right? 1) This is originally a recipe for spicy turkey meatballs – but I’ve never seen minced turkey being sold anywhere in Singapore so I substituted it with minced chicken, which is readily available in the hypermarts here. I’ve also omitted the red pepper flakes. 2) Ina’s recipe used Italian pork sausage and prosciutto, but both of these ingredients are expensive to obtain, so I got a cheaper but equally good alternative – minced pork and bacon. I upped the amount of salt added as the minced pork is fresh, hence it’s not salty like the sausage. 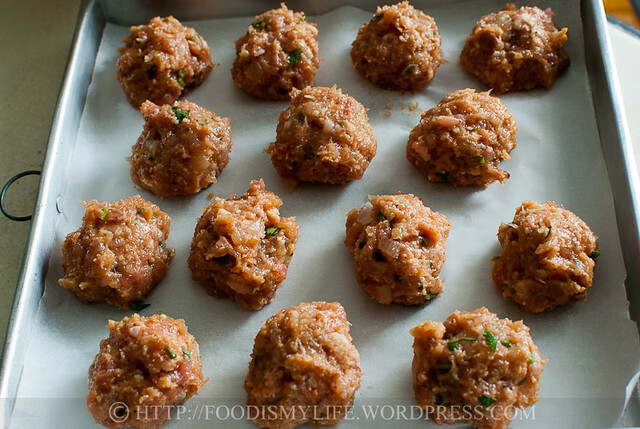 3) I love the flavours of onion in meatballs, so I wanted to add in an onion. However, I did not want to give the meatballs a raw onion taste, so I decided to sauté it with the bacon to get rid of the pungent raw onion taste. I also added a garlic clove into the mix, I’m not sure how it helps with the flavours, so I guess it’s optional. 4) Ina used aged Asiago cheese – which is not common here too, so I used plain old good-quality Parmesan cheese and reduced the quantity used from the original 45 grams to 30 grams (1/2 cup to 1/3 cup). 5) Ina served this over spaghetti but I was lazy to cook up a pot of pasta and marinara sauce, so to pretend I’m having the meatballs with pasta and marinara sauce, I added in some tomato paste into the meatball mixture. I brushed the top with more tomato paste and then served it with a very simple potato and carrot mash. And the resulting meatball is unbelievably tasty! My family, X and I loved these meatballs to every single bit. I made them pretty huge because I’m serving them plain, 1.5-inch per ball and yielded about 30 meatballs. 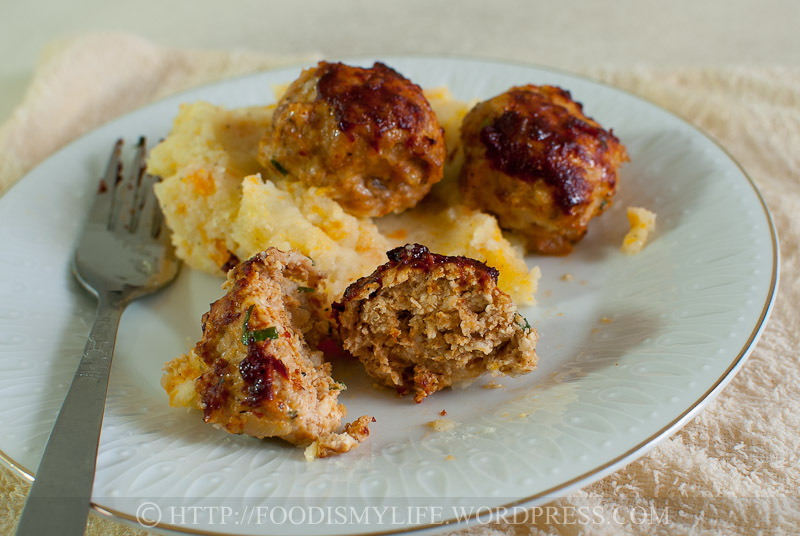 These meatballs would be perfect for potlucks, picnics and even BBQ. So I reckon it’s time to stop imagining and get started on these meatballs! Start off by placing bread crumbs in a small bowl. Bread that is slightly aged is easier to process into crumbs. Or you can lightly toast fresh bread and cool it completely before processing it into crumbs. I’m using Japanese bread crumbs here (Panko) because I have no bread at home and I’m just too lazy to buy and process my own bread crumbs. 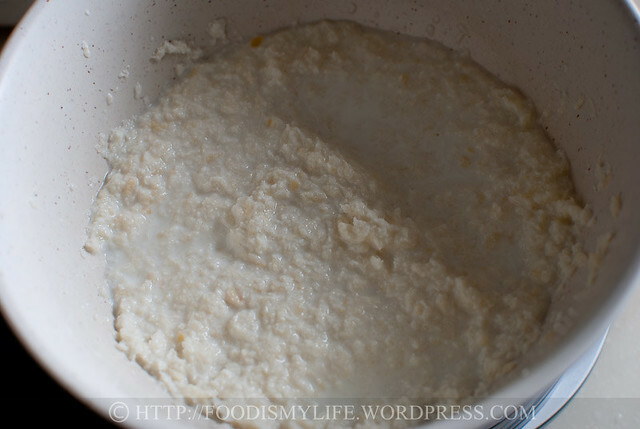 Add in milk to soften the breadcrumbs. 1) They make the meatballs tender. I’m guessing some chemical reaction occurred between the meat proteins and the carbohydrates from the bread. 2) Softening with milk helps them to combine with the egg better to form a “glue” to hold the meatballs together. It’s like baking a cake – you need some eggs and some flour (most of the time) in order to give the cake a solid structure. 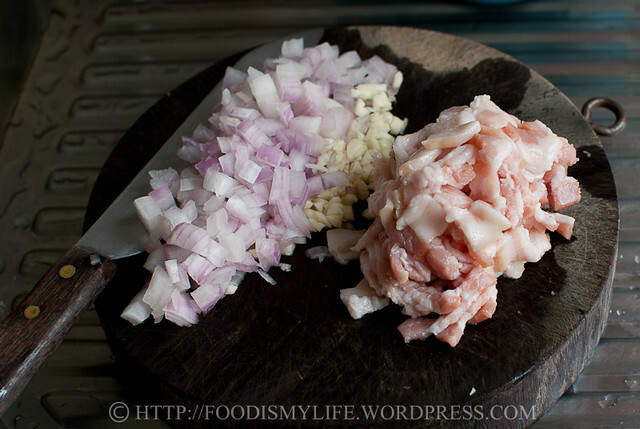 Chop up an onion, mince a garlic and snip the bacon into small pieces. The onion and bacon should be chopped into very small pieces so that it’s easier to form the meatballs – if the onion and bacon pieces are too huge, they will interfere with the structure of the meatball, which may result in your meatballs falling apart. 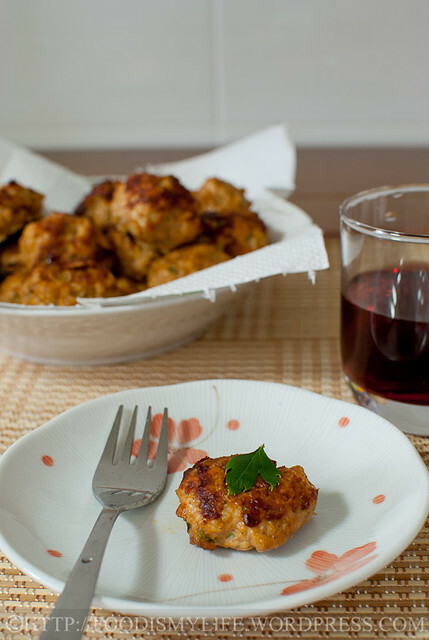 This is especially important if you want to make mini meatballs. 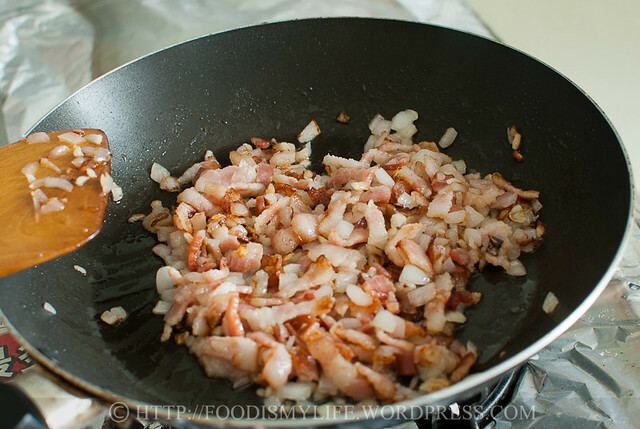 Sauté the bacon in a frying pan. I didn’t add any oil as the bacon will render some fat on its own and there should be enough to sauté the onion and garlic later on. Add in onion and garlic. 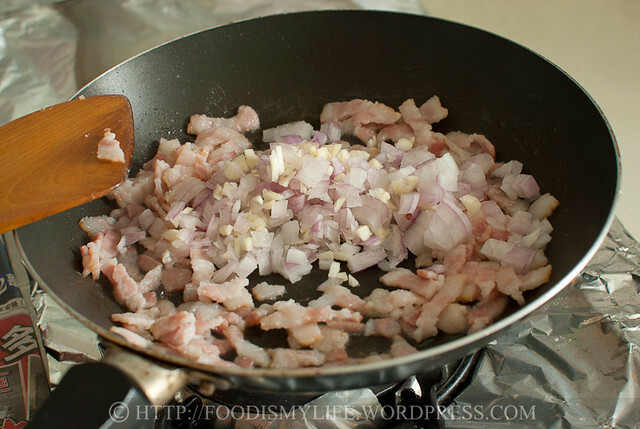 Cook until the bacon is slightly crisp and the onion has softened. The whole process takes about 7-10 minutes, I don’t want to cook the bacon until it’s too crispy, because I want to avoid having two distinct textures in the meatballs – tough and crispy from the bacon and tender from the rest of the meatball. If you are omitting the onion and garlic and using prosciutto instead of bacon (Ina’s original recipe), skip the whole sauté part and just snip / chop the prosciutto finely and add it into the meatball mix. I used a 2:1 ratio of chicken to pork. Choose lean meats with a little fats – fats will give meatballs flavour, make them juicier and prevent them from drying out during baking. Dump in all the ingredients! Scoop a little meatball mix and roll into a meatball. I press the ball with a light pressure to compress it slightly to prevent it from falling apart. 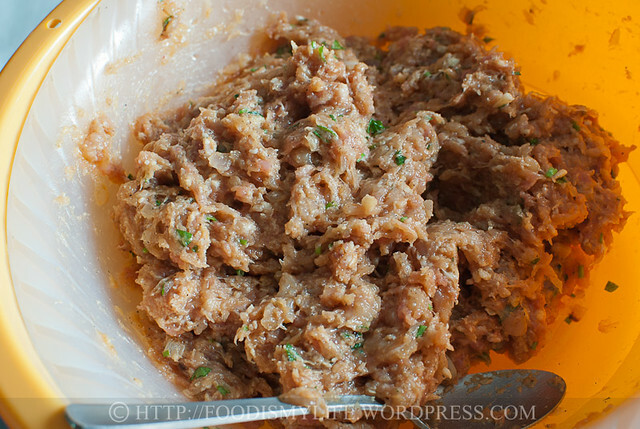 Combine some tomato paste and olive oil and brush / dab / plop some of this mixture on top of the meatballs. Bake until they are completely cooked through. Serve plain or with some delicious potato-carrot mash! Preheat the oven to 200 degrees Celsius (400 degrees Fahrenheit). Line a large baking sheet with parchment paper. In a small bowl, combine the bread crumbs and milk. Set aside. Set a frying pan over medium heat. 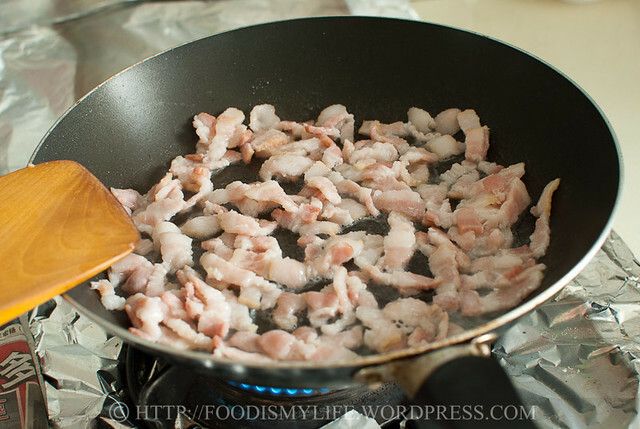 Add in the bacon and fry for several minutes, until oil is rendered from the fats, 2-3 minutes. Turn the heat down to medium low and add in the onion and garlic. Stir-fry until the onion has softened and the bacon is slightly crispy (too crispy and they will be too hard to chew later on), about 4-5 minutes. Remove from heat and let cool slightly. Combine bacon mixture, chicken, pork, parsley, Parmesan cheese, 2 tablespoons tomato paste, egg, oregano, black pepper and salt in a large mixing bowl. 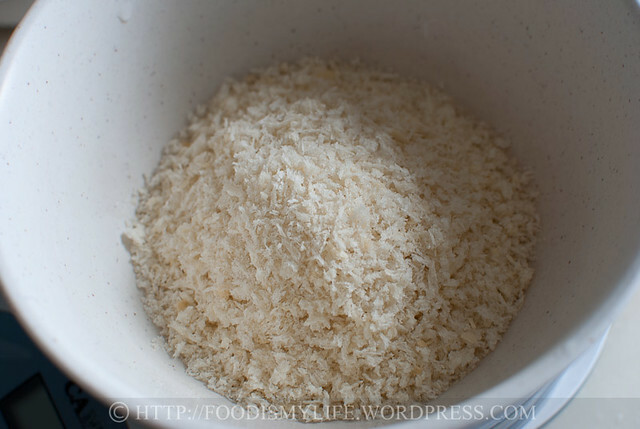 Drain the bread crumbs, squeezing it lightly to get rid of excess milk, and add into the mixing bowl. Discard the excess milk. Stir the mixture with a large metal spoon (or use your hands) and mix thoroughly. 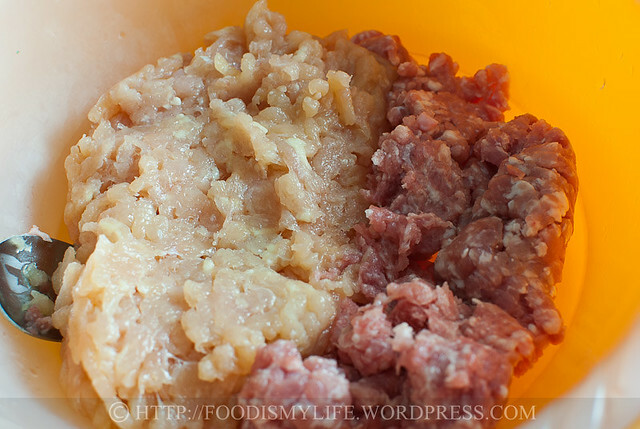 Shape the mixture into 1.5-inch large meatballs. Place them on the lined baking sheet. Combine the remaining 2 tablespoons tomato paste with the olive oil. 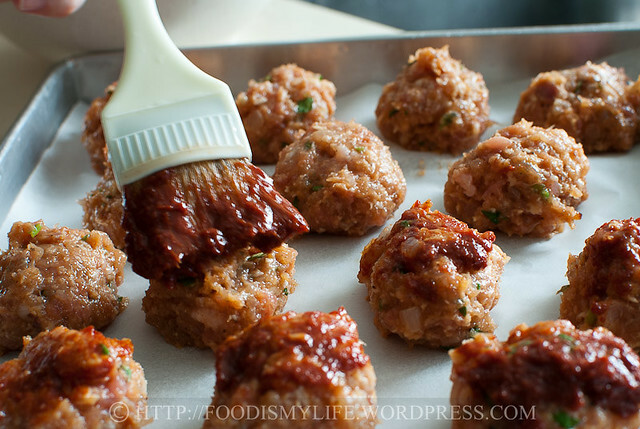 Brush the mixture over the meatballs. 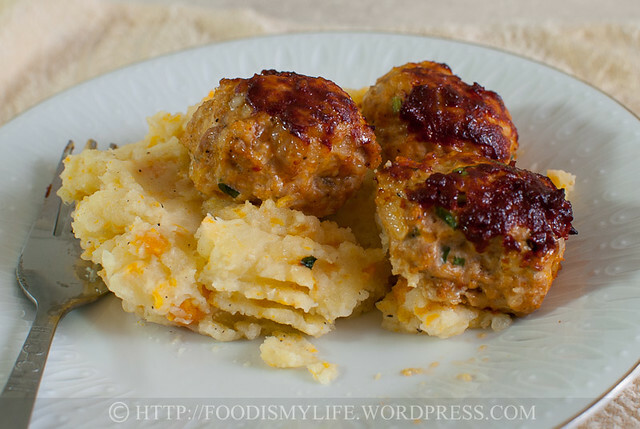 Bake the meatballs for 20 - 25 minutes until fully cooked through. Serve with some freshly-made potato and carrot mash! 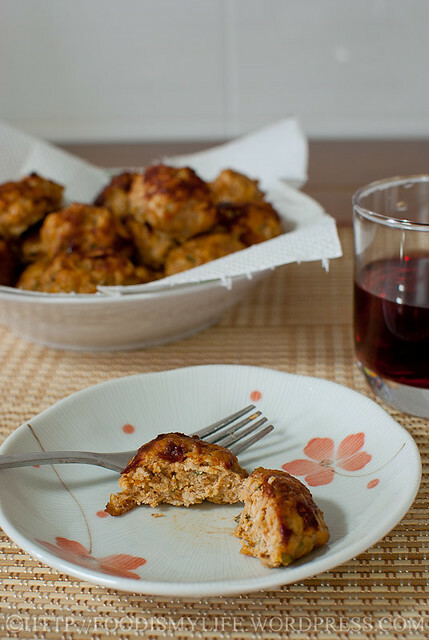 - Adapted from Ina Garten's Spicy Turkey Meatballs from Barefoot Contessa - How Easy Is That? To make fresh bread crumbs, grab 2 to 3 slices of day-old bread and process it in a food processor until you get fine crumbs. Substitute bacon with pancetta or prosciutto. 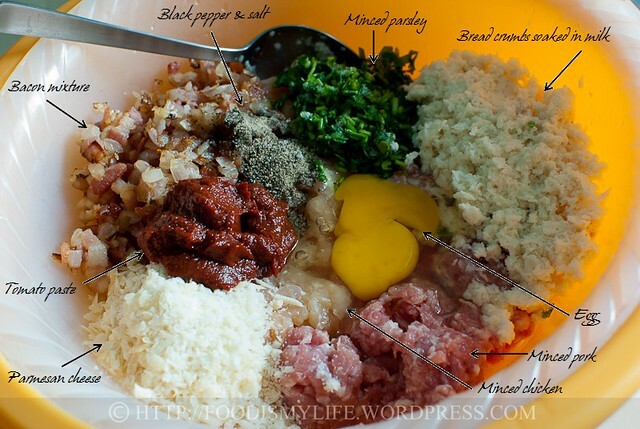 Substitute minced pork with sausage (remove the casing before adding it in). Reduce the amount of salt added as sausage is salty. I added 3 pinches of salt and the meatballs were just the right amount of saltiness for us. X did not really like the tomato paste mixture on top as it gave the meatballs a slight sour taste, but he liked the tomato taste in the meatballs themselves. My family members and I liked both versions – with and without the tomato paste on top. So, if you are not a huge fan of the sour taste on top, don’t brush it with tomato paste. The top will not be as browned as those in the photos. Add in 1/2 teaspoon crushed red pepper flakes into the meatball mixture for a spicy kick! Thank you! The meatballs were really delicious, I regret not making more to freeze them! They look delicious and your post is great with all the step by step pics, thanks for sharing! 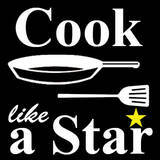 I love meatballs, my mom makes some great chicken and pork meatballs, I love you recipe and the step by step photos!! Thank you for the compliments! Oooh I can’t wait to see how your meatballs turned out. The parchment really helped, the meatballs didn’t stick at all, and the clean up was a breeze! Thank you, aww I’m tempted to make them again too! Thank you John! I was really lazy that day haha. I regret not taking step-by-step photos of the mash, it turned out surprisingly good! Glad you like them! Thank you Joyce! Yea I think those ingredients would be really expensive to obtain, so I’m really happy the substitutions worked really well! Great step by step photos! Seeing the dish coming together definitely made me hungry. These look so delish. I haven’t seen any turkey mince in India, heck we don’t even get parmesan over here easily. Some speciality shops do stock these but then the prices are too steep. Can’t wait to try your modified version! this does look absolutely scrumptious, and i think i might try supersizing it for a beef burger patty soon! These look amazing. I need to make these stat! These do sound (and look) delicious. 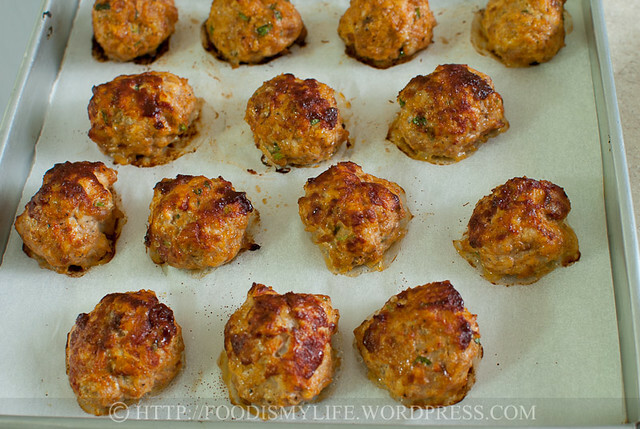 I’m toying with the idea of going back to my original for the Eastern Med meatballs and baking those in the oven. And, you didn’t have to flour them. That’s comforting to know. Did they stick? Or maybe the parchment helped. These meatballs sound delicious and though I’ve never thought to add a carrot to my potato mash, I will now. That, too, sounds delicious. I’ll be giving both recipes a try. Oh, WOW! Yum, yum, yum! I’m drooling just looking at the photos! You have made wonderful substitutions! I have not seen ground turkey over here too, and Asiago Cheese, I think I need to go to the special supermarket where the expatriates do their shopping for imported stuff, and that too, might not be easily available! Those meatballs looks so delicious! !